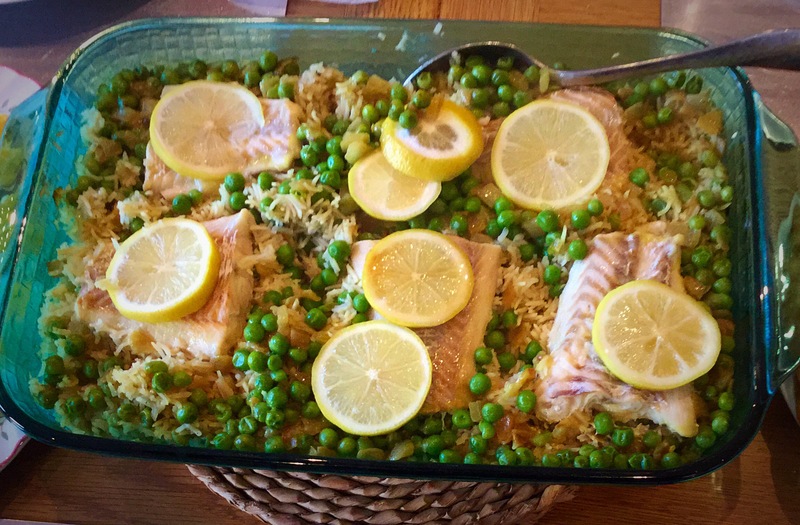 Kedgeree, for those unfamiliar with the dish, is a mix of rice, smoked fish, the occassional vegetable, and curry flavouring, traditionally served with hard boiled eggs. It originated, Mrs S believes, in British imperial India, and was eaten for breakfast. Mrs S must have been feeling especially bullish regarding her offsprings’ yearning for culinary adventure when she planned this meal, because serving them curried rice with anything sounds lunatic in hindsight. Nevertheless, it was a greatly adapted from the original concept: she sauteed some chopped onions with mild curry powder until soft, then added some uncooked basmati rice and peas (why not?) to coat them in the curry flavouring, and tipped the lot into a cassserole dish, poured over some vegetable stock, placed some haddock fillets (unsmoked, because she is a Philistine) on top, and as a last minute imporvisation topped the fish with lemon slices and covered the whole thing with foil to bake in a medium-hot oven for about an hour. Then she hardboiled some eggs, and warmed some store-brought naan. The result was tasty, thought Mr and Mrs S. N shoved handfuls of it into her mouth (but then, she is the ‘easy’ one); C ate a decent portion (she is the adventurous one), discovering that warm naan dipped in chutney really does the business; R sulked, but was ultimately persuaded that dinner was edible, and could he have more naan please? This is a remarkable result. Mrs S had been looking forward to Sunday’s supper all week, because it was Thai Burgers. This may sound humble, but it is one of the best meals she makes. Everyone loves Thai Burger night. Mix by hand a pound and a half of lean ground pork, 3 Tbs Nam Pla (thai fish sauce), 2TBS dark soy sauce, two sticks of finely minced lemon grass (a couple Tbs if you can buy it ready minced), the zest and juice of one lime, a squirt of sriracha or a minced chili or two (optional: wear gloves to mix if using chilli), and a handful or two of breadcrumbs. Form into about six burgers and griddle or grill as desired. Just a note: Mrs S has discovered that doubling the meat does not require doubling the nam pla and soy sauce. Add a bit more, but don’t overdo it or the burgers will be too salty. These deeply satisfactory burgers were served on toasted burger buns (except the itsy-bitsy tiny baby burgers Mrs S always makes for the little girls). The perfect condiment is a blend of mayo, sriracha, lime juice and sweet chilli sauce. The children prefer ketchup. 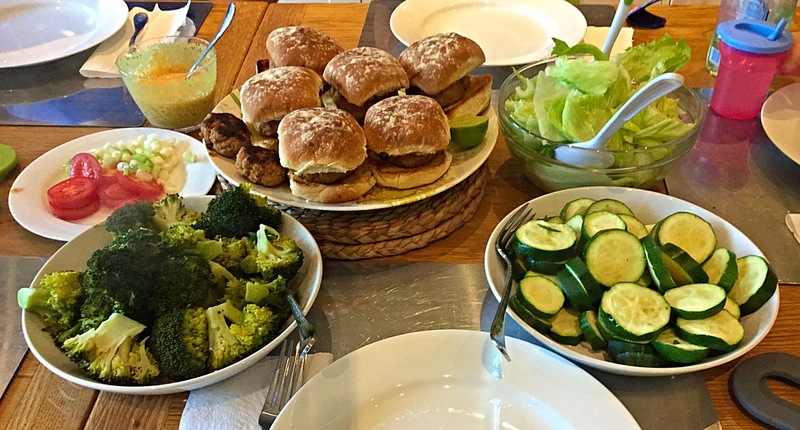 Mrs S also prepared a plate of lettuce, tomato and spring onion to garnish the burgers. N ate most of the tomato and spring onion before the rest of the meal was ready. Mrs S always pretends to be aggrieved when the children pilfer fresh veg before dinner, as it seems to encourage them to do so. On the side Mrs S provided steamed broccoli and steamed zucchini, or “Girl food,” as Mr S calls it. So far, so ordinary, really, but wait: there’s more! 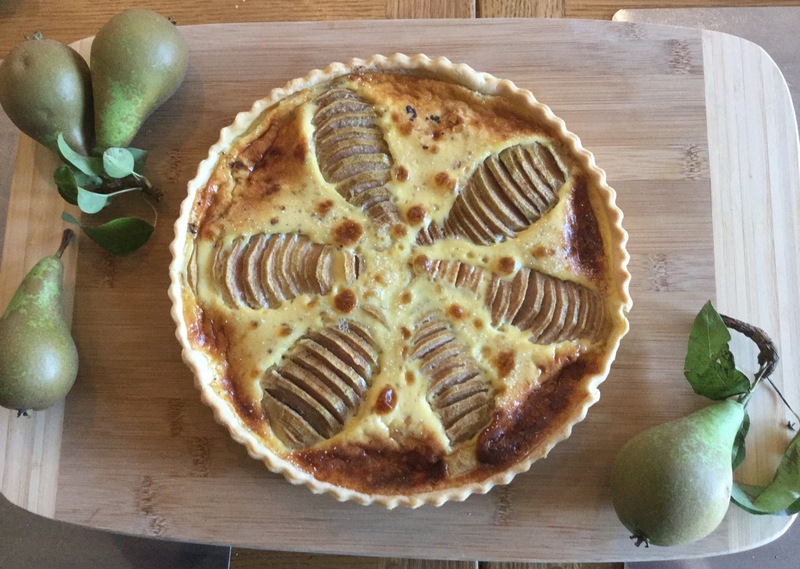 Following the S family making utter pigs of themselves, Mrs S brought out the real star of the show: A pear, chocolate and custard tart made with pears from the S’s back garden. Good does not begin to describe it: sublime, unctous, indulgent, and justifying all the smugness Mrs S took forward into the new week. Eat your heart out, Delia Smith. The truly amazing thing is that there were leftovers: Monday’s breakfast made easy. “Taco night! It’s taco night! Can I chop the peppers for you, Mommy? Can I chop the tomatos for you, Mommy? Can I put the olives in a bowl? I’ll warm up the soft tacos! Can I grate the cheese? Do we have any MILD salsa?” rang through the house once the children discovered it was in fact taco night. Once it was established that, as a big girl who now goes to school all day C may use a sharp knife to cut the tomatoes, and likewise, R may use one to cut the peppers if he promises to cut AWAY from his fingers and not attempt to amputate them again, (perhaps ‘not attempt again to amputate them’ would better reflect the undire, but slightly bloody, nature of the history referenced.) the children were happy to help. There is no tragic punchline; no fingers were so much as nicked, C was declared the resident ‘tomato chpping expert,’ and Mrs S was content to stir the beef around in the pan and grate the cheese (there are limits to the sharp edges with which she trusts her children). In the end, what was served was milddly spiced beef, soft tacos, chopped tomatos, peppers, and green onion, shredded lettuce, black olives, refried beans, grated sharp (mature) cheese, sour cream, spicy salsa, and super-spicy west-indian chilli sauce (the means by which Mrs S childproofs her food). After dinner, as though keen to demonstrate what a superior mother Mrs S really is, the older children read their reading books, and then everybody got ready for bed with a minimum of drama. Tuesday: On which day they hurriedly ate pasta. Tuesday was meet-the-teacher night at the children’s school, when parents are invited along to explore the classroom and put make sure they are well-known to the teachers as valuers of education who will broke no nonsense, or something like that. This evening event runs from five to six, which puts a real wrench in the dinner schedule when one routinely puts one’s two and four year old daughters to bed at 6:30. So Mrs S made pasta with a jar of sauce, and they ate at 4:15. She provided two types of grated cheese, and a plate of sliced apples, so clearly she was still making an effort. And it was ready at quarter past four, so clearly she is a prodigy of organisation and timekeeping. Meet the teacher night was enjoyed by all. Then it started raining as though an ark would be required, the school started to flood, and as the S family was driving home, the fire brigade was arriving to pump out the front office. These woud be called turkey cutlets by many Americans. The idea is: thin slices of turkey breast, breaded, lightly fried, served with mashed potatos, carrots, peas, maybe some corn, maybe creamed spinach. Actually, it turned out Mrs S didn’t have any potatos, so she made rice, cooked in chicken stock, which the children refused to eat. (Philistines.) She peeled and chopped carrots, put them in the microwave, and then forgot to cook them. This turned out not really to matter, as she couldn’t remember what the four stages of breading turkey are. Milk, flour, egg, breadcrumb, she now knows (She only cooks this dish two or three times a month, whyever would it be etched in her brain? ), but the children kept arguing and changing the CD she was listening to, and leaving toys right behind her to be tripped over, and she had gotten out only three plates for the necesssary ingredients, and could not recall why. (It turns out that this is because the turkey comes from the butcher’s, and is brought home in a plastic bag, into which she can just slosh a bit of milk, saving the need for a fourth plate…but life by Wednesday Mrs S was only just a functional adult, and could not be expected to remember everything). Meanwhile, C couldn’t find her reading journal for school, N wanted a snack, and R was in a mood because he wanted to watch TV, but hadn’t done his reading book yet, so couldn’t. Then Mrs S remembered to cook the carrots. Then she managed to get the girls to stop changing the music and just dance to Adele like good middle class children. Then she breaded the turkey and cooked it. Then she remembered her intention to provide more than one vegetable, and opened a tin of creamed corn (which Mr S and C both regard as quite the special treat). In the end they ate delicious turkey cutlets, slightly crunchy carrots, a bit of corn, and “not the rice we like.” And all of that wasn’t ready until 5:45, which is late for the S children, though early to the rest of the world. At 6pm, in the midst of intensive negotiations regarding vegetable consumption (“But you all LIKE carrots! No you may not have a treat! Finish your veg!”) she looked at the clock, realised it was still two hours until the Great British Bakeoff was on, and almost burst into tears, despite not usually caring whether she saw the show or not. It was all so very sad. Bedtime was a disaster, being slightly later than normal, but eventually the children were in bed, and Mrs S made herself a coffee, spiked with amaretto. Unfortunately, she forgot that, the time being 8pm, she needed to switch to decaf, and instead of being soothed and gruntled, got the shakes. Mrs S rather overdid the caffeine on Thursday. R was having his supper at a friends’s house, and C was particularly exhausted as she neared the end of her first full week in fulltime school. So Mrs S made the girls Cheesy-Peasy Pasta and let them eat it while watching Frozen. Boil some pasta. Reserve about half a cup of the water before draining. Return to pan over low heat and add a couple spoonfuls of cream cheese (soft cheese), a couple handfuls of grated cheese, and a small bowl full of cooked peas (optional; bits of ham or bacon or chicken can go in too. Or not. we’re not trying to win Michelin stars here…). Stir to melt cheese. Add the pasta water a Tbs at a time to get the right slack, creamy texture. Season with a bit of black pepper, and salt if you’re a complete nutter. At the end, if it’s on hand in the fridge, Mrs S often adds a Tbs or two of sour cream, which makes this dish wonderfully creamy. Do as you like. This is a dish for days when you can barely form coherent words, or just need the kids to be in bed 15 minutes ago, so no one will judge you on faithful adherence to recipes. Around eight o’clock when the children were asleep, Mrs S recalled that she hadn’t actually made anything for herself and Mr S, which would explain why the latter looked decidedly grumpy. So she made more pasta and stirred in some tomato and chilli pesto (from a jar, of course). She asked Mr S if he wanted her to grate some cheese. He looked terrified and spoke not a word. So she asked again, more sharply. “I don’t know the right answer, and I don’t want to get in trouble!” the 6’4″ mountain of a man cried. Mrs S stomped off to grate the cheese. Friday: On which day dinner came from the freezer. The only addition to this compendium of convenience food was pretty little cakes from the bakery. This is becasue when Mrs S arrived to pick R and C up from school, C marched out at the front of the Reception (Kindergarten) class wearing a crown with the words “Star of the Week” emblazoned accross the front. The little girl’s grin was so large the corners of it disappeared under her crown. The teaching assistant told Mrs S how good and hardworking C had been all week. C then piped up to say “But that’s not why Mrs L [the teacher] said I was Star of the Week! We have to be good and work hard all the time, no matter what. Mrs L said I’m Star of the Week for being a kind and gentle friend!” And Mrs S figured that deserved celebratory cakes. Then the children were in bed, and Mrs S had showered and put on her pyjamas by the time the Rugby World Cup kicked off at 8pm. Mrs S was too tired to open any wine. Too tired for wine! Hopefully she will recover.